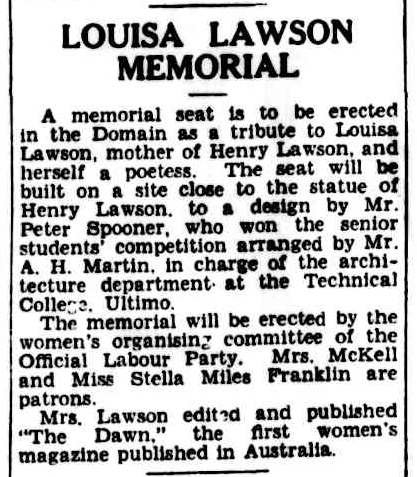 “The Dawn”, Louisa Lawson & Australian Female Suffrage. 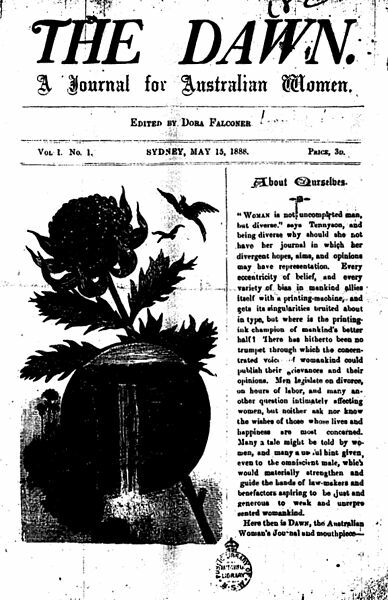 … wrote Louisa (Albury) Lawson in the early days of Australia’s first feminist journal, The Dawn (1888-1905). She was the proprietress, printer and publisher, employing exclusively women in all aspects of the business. 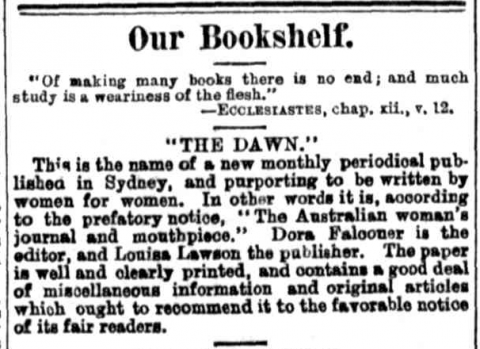 The Dawn gave Australian women a voice for the first time and is now freely available through the National Library of Australia’s “Trove” website, thanks to a 2011 fundraising campaign by Melbourne businesswoman, Donna Benjamin, to digitise the publication. Louisa (Albury) Lawson was an independent and resourceful woman who fought for women’s rights during the late nineteenth and early twentieth century in Australia. Born 17 Feb 1848 on Edwin Rouse’s station, Guntawang, near Mudgee, New South Wales she was the second of twelve children of Henry Albury, station-hand, and his wife Harriet (Winn), needlewoman. 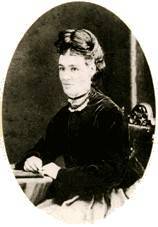 Baptised an Anglican, Louisa was educated at Mudgee National School where J.W. Allpass proposed making her a pupil-teacher. Instead she was kept home to help care for her younger siblings, which she resented. 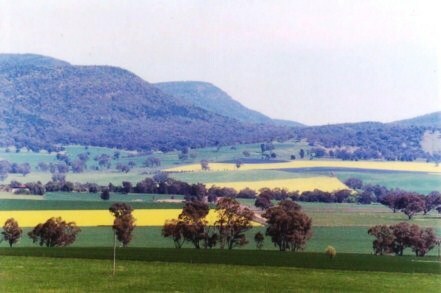 Weddin Mountain, New South Wales. Peter was often away gold mining or working with his father-in-law, leaving Louisa on her own to care for the property and raise four children – Henry 1867, Charles 1869, Peter 1873 and Gertrude 1877, the twin of Tegan who died at eight months. Louisa grieved over the loss of Tegan for many years and left the care of her other children to the oldest child, Henry. This led to ill feelings, on Henry’s part towards his mother, and the two often fought. Henry became one of Australia’s most famous writers. After her marriage ended, Louisa kept up the pretence of being separated from her husband, by misfortune. Peter sent money irregularly to help support the children and she considered taking legal action. Instead, in 1883, Louisa moved to Sydney and supported her family by doing washing, sewing and taking in boarders. In 1887, using the money she’d saved, Louisa purchased shares in the radical pro-federation newspaper, The Republican, which she and Henry edited and printed on an old press in her cottage. The Republican called for an Australian republic uniting under “the flag of a Federated Australia, the Great Republic of the Southern Seas”. The Republican was replaced by the Nationalist, but it lasted two issues. With her earnings, and experience working on The Republican, Louisa was able to edit and publish The Dawn the following year. With a strong feminist perspective, it fequently addressed issues such as women’s right to vote and assume public office, women’s education, women’s economic and legal rights domestic violence and temperance. It was published monthly for 17 years and, at its height, employed 10 female staff. Louisa’s son, Henry Lawson, also contributed poems and stories and, in 1894, The Dawn press printed Henry’s first book, Short Stories in Prose and Verse. Louisa (Albury) Lawson launched the campaign for female suffrage in 1889 when announcing the formation of the Dawn Club where women met to discuss “every question of life, work and reform” and to gain experience in public speaking. Louisa Lawson could claim success when, in 1902, women in New South Wales gained the suffrage. She was described as “the Mother of New South Wales Suffrage”. Retiring in 1905, but continuing to write for Sydney magazines, Louisa (Albury) Lawson died in Gladesville Mental Hospital on Thursday, 12 Aug 1920 aged 72, after a long and painful illness. On Saturday 14 Aug 1920 she was buried with her parents in the Church of England section of Rookwood Cemetery. The small obituary in The Bulletin gave as much space to the fact that she was Henry Lawson’s mother as it did to her role in the achievement of votes for women. This entry was posted in Gold Fever, History, Uncategorized and tagged Australian History, Family History, female suffrage, feminism, Louisa Lawson, Mudgee, The Dawn Journal by Catherine. Bookmark the permalink. This is a great post on Louisa Lawson!! I’m a friend of Donna Benjamin and supported the digitisation of The Dawn but I didn’t know this much about Louisa. That you recognise what Louisa did and how important she was.That you share this with others who only one of whom needs to be as inspired as you were, and as inspiring as she was, is enough to make sure the memory will never die. It was a beautifully written piece. Thankyou so very much Lord David for your very timely and complimentary comment. It is my mum who taught me the importance of “the vote” and the battle for ordinary working people, especially women, to be given a voice in how their country was run, which “politicised” me… along with “the Whitlam Dismissal” and the conscription of our youth into the Vietnam War… to name just two hugely controversial issues here in Australia during the 1970’s. Of course I’ve passed this awareness onto my own children who also value their democratic right to vote. We don’t all necessarily share the same political perspective which certainly leads to some lively political debates, at times 🙂 This sure “warms the cockles of my heart”. Thanks again. Ormond Grace B.A. student … Australian literature this semester, researching Louisa Lawson. What a shame that this great Australian pioneer has not been recognised. Well done Catherine.